What role does storage play in enabling networks to reach their full potential? Did you know that North America has only enough energy storage to provide power for 20 minutes? Other networks we rely on have days or even years worth of storage buoying their reliability. 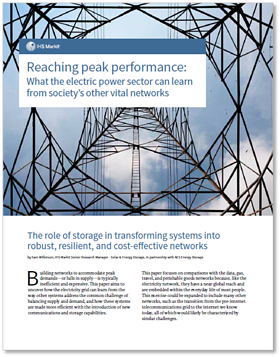 Learn more in the IHS Markit White Paper, "Reaching Peak Performance: What the electric power sector can learn from society's other vital networks."